An official in Mazandaran province, on the Caspian Sea, said the winter storms were the worst in 50 years, with two metres of snow falling in some areas since the weekend. All schools in Mazandaran will be closed on Tuesday, state media reports. 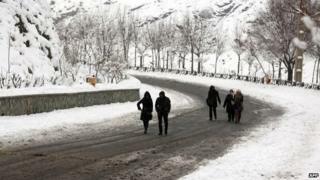 The head of Iran's Red Crescent said around 11,000 people had been rescued after getting stuck in heavy snow. "Some 3,800 people have also been settled in emergency shelters," Pir Hossein Kolivand was quoted as saying by the official Irna news agency. Irna reported that 79 people had been taken to hospital as a result of the bad weather. Troops with the Revolutionary Guard have been delivering supplies to people trapped in both Mazandaran and neighbouring Gilan province, and helping with evacuations. In many areas of the provinces, roads have been left unusable. Iranian President Hassan Rouhani has ordered all government departments to provide extra help to those affected.